Being the major audience in the current whirlwind of cyber world, startups are increasingly inspired to build powerful mobile apps for quick organic growth, enhanced customer acquisition and brand marketing just like conspicuous brands. Technology-enabled innovation is the best way to make business entrepreneurs interact with their customers. Like many other industries, Education is also warming up to get transformed and revolutionized with digital solutions. 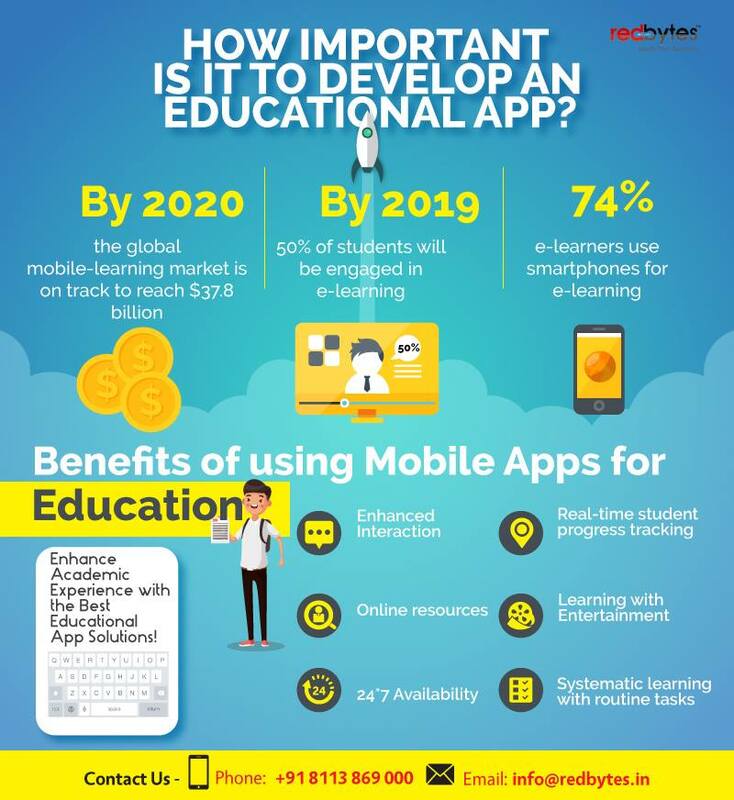 There are a few good apps making its way into education industry to enable better learning. However, to build robust and engaging features, the companies of varied scales need a solid, trustworthy mobile app development partner who has in-depth knowledge of latest technologies. To implement innovative ideas, its critical to find a company committed to delivering unbeatable quality. To make things easy for you, here is the most comprehensive list of top 10 educational app development companies in India who are well-versed in building gamut of mobile apps. Founded in 2009 and situated in Pune, Redbytes dwells on the top of the app development companies that possess sheer, unrivaled capabilities to develop apps across wide industry verticals. With a talented team of skilled app developers forming the mighty foundation of the company’s soul, the size of the company ranges from 100-250; Redbytes capitalize on years of experience, knowledge and wisdom to face massive challenges. Sophistication and simplicity is their obsessive motto. From design to development, they cover every smallest of client needs to achieve absolute customer satisfaction. Apart from iOS and Android apps, they are also competent at building IoT-powered solutions, Enterprise mobility and mobile games. Founded in 2004 and located in Trivandrum, QBurst is an excellent mobile app development company in India with pleasant track record of delivering scalable projects. This innovative company has an impressive portfolio that covers services based on modern technology, including Mobility, Cloud, web and Analytics. Its development centers are situated in Australia, Singapore, Dubai, Saisbury (UK), Sunnyvale (USA). With enormous employee strength of 500-1000, QBurst boasts of being a top class and trusted company equipped with contemporary resources and polished skills of design veterans, development specialists and QA experts. The company has delivered more than 1000 successful projects across diverse industries. Openxcell is a singular and quite a distinguished name among mobile app development companies in India. Based in Ahmedabad and established in 2008, the company stands out with its innovative software and high-end services in domains of website and mobile app development. The company’s glory stems from the fact that it was awarded as a “Best Software Development Company in 2014 and 2015 by GESIA. With the size of 100-250, the company has successfully delivered Inventory Management Software, Enterprise Chat for collaboration, e-commerce and web and products based on Blockchain Technology. It has its development center in US as well. Clients: Google, Motorola, Unilever, UTV, Conagra. Extremely appreciated for its excellent turnaround time, Hyperlink Infosystem is a dynamic app development firm in India located in Ahmedabad. Founded in 2011, The firm possesses explosive technical insight and consistently delivers mobile app solutions of exceptional quality to their clients across the globe. With extensive relevant experience in the industry, Hyperlink Infosystem can be considerable for educational app development for Android and iOS and Windows platform. Having the size of 150-250, The company has hitherto developed more than 500+ mobile applications and custom software and also dabbled in intelligent projects on Virtual Reality and Augmented Reality. Located in Ahmedabad and set up in 1998, IndiaNICInfotech is crowned as one of the oldest-running leaders in mobile application developers in India. Their professional achievements rely greatly on the latest technologies leveraged for developing incredible web, mobile app and games. Their competitive services and business-class products have earned them immense trust from clients across the globe. Being a size of 10-250 employees, their major talent lies in the fact that their skilled developers are able to deliver challenging large projects with admirable efficiency. Being obsessed to superior quality is company’s leading motto and their strength is iOS and Android app development. Located in Noida and founded in 2014, Appinventiv is a successful mobile app development brand in India. Known for delivering high-performance and addictive products to its clients, they have mastered leveraging latest mobile app and web development technologies. Their operating centers are in India, Dubai, US, France and London. They comprise of a portfolio bolstered with 500+ grand projects deployed across the globe for startups, renowned firms and individuals, including the ones based on Blockchain and VR. Having the team of 350+ talented experts, Appinventiv is ISO certified and influences the market with their passion to help enterprises of all scales dominate their niche through mobile apps. Clients: nexGTv, Gullak, UCLA and Kmart. NineHertz boasts of its strength of 200+ employees including top-notch developers, resolute business consultants, talented marketing pros and industrious project managers. Delivering ambitious apps for world’s most credible brands, they have produced over 1000 mobile and web apps for both iOS and Android. Their apps have been among the top 10 most downloaded apps in Apple and Google store. Clients: RelienceJio, Jaipur Metro Rail Corporation, Casio, Samsung. Based in Ahmedabad and set up in 2003, Hidden Brains leads the arena of iOS and Android mobile app development companies with being the one stop solution for diverse software development. it operates with a size of 100-250 employees. Offering high-quality products and security assurance, the company delivers competitive and capable mobile apps for enterprises and startups on global scale. Strong with a pool of talented and dynamic young-age software developers, Hidden Brains leverage the best of technology to deliver over 1000 mobile app and web projects. The company has its development centers in US and Norway and also provides services in Ecommerce, Big Data and chatbot development. Clients: Raymond, First Bank, Centurus, SmartEbook, Oh TV, The Franklin Mint, Dalzwithit. Founded in 2012, Code Brew Labs is another technically accomplished player in the domain of IT services with more than 100 employees working for its glory and success. From ideation to deployment, Code Brew Labs cover a vast spectrum of services and has elite designers and developers in place to deliver sound expertise and industry-grade insight across various business verticals. The company has many long-term clients across the world and has delivered over 300 Live app on both Apple and Google Play store. Their client base encompasses a range of businesses including medium to large scale entrepreneurs and Fortune 500 companies. The company has perfected the art of using complex technologies to deliver simple solutions efficiently. Located in Jaipur, with development centers in US and UK, Konstant is Infosolutions is a custom software and mobile app development company. Established in 2003, the company has proven expertise in mobile app development for iOS and Android, and believes in delivering exceptional quality to all kinds of business structures from startup to large enterprises. Being a size of 100-250, the company focuses on creating powerful innovations and each project they complete speak of original creativity and sheer talent. With over 10 years of experience in software development, the firm has also mastered IoT, Cloud and wearable development, successfully delivering over 1000 apps and websites with an impressive repeat business rate. Clients: Vokswagen, Jasmin TV, Rawbank, Zulo, Taskclone, Findme. These are the top 10 App development companies in India that have dazzling capabilities of building Educational apps for iOS and Android platforms in 2018. The preferences we have chosen here are purely based on their performance, success rate, specialties, client testimonials and portfolio strength. Tomorrow, new companies may emerge and rise to find a spot on the list. We welcome you to put in your valuable suggestions in case you have the best one on your mind.